I have known Catti from Tuss since I saw her really amazing store in Stockholm, Sweden. I entered the store, and I couldn't believe how wonderful--all white, black and grey, NO color! just luscious and wonderful clothing, I was hooked immediately but it still took a bit for me to write an order for nonchalantmom. I wasn't sure that everyone was ready for 'the ultimate simple solution'! but you all proved me wrong when I sold out of the first collection in record time... and I know why, tuss is the best understated and wearable clothing you will find for kids! if you want to invest in something minimal and chic, in only the most simple way, you will be very happy in tuss! Catti Aman is the woman behind the solution! she believes that only the highest quality fabrics and construction belong on kids and she is right! it's a very Scandinavian approach; practical, comfortable and functional with a heavy emphasis on design. "I work with a neutral palette because I think children's clothes are gender defined from day one….I believe that finding high quality, simply designed clothing in neutral colors is difficult, so I wanted to fill that space in the market, Catti said in a recent interview. "Most of the designs this season can be used as a dress and a tunic; a lot of the pieces can be worn by either boys or girls. I use great materials like cotton, cashmere and wool that are easily combined and washable without being boring. I believe in making timeless yet contemporary pieces that allow kids to play and feel comfortable and look great at the same time." Catti's background as a curator in contemporary art and design is reflected in her minimalist creations. "The design is reduced to the essential leaving out excess decoration and loud visible labels," she says. Employing her skills as a curator, Catti hires well-known designers and artists recognized for their work in other mediums (like Anna Kleberg, a photographer in Sweden who illustrated a limited edition of T-shirts for Tuss) to contribute to her collection. Catti we are so glad to have your collection at nonchalant mom and if, say in the near future, the dollar gets stronger we will be only more happy to have more Tuss!! Tuss :: the ultimate simple solution is available at nonchalant mom. Start with a 4 foot by 4 foot plywood piece for the base with a good thickness. I used leftover primer (1 coat) and exterior paint (2 coats) to coat both sides for weather proofing. No need to worry about color, since nobody will really see it. While the paint dries you can prepare the other wood pieces. After the paint dries you can drill some very small holes (anything larger will allow sand to fall through) into the plywood base all over the place randomly to help moisture escape if your sandbox is exposed to the elements like mine is. I set four corner studs using 4 by 4 inch pieces of cedar (perfect weather resistant wood) on top of the plywood base and screwed 4 screws in through the bottom of the plywood attaching the 4 corners. Each piece of corner stud I cut at about 5 inches in length. Halfway across from each corner stud I screwed an approximately 12 inch long piece of scrap 1 by 2 inch wood (that I cut from an existing 2 by 4 inch piece of wood) to the same plywood base. This would help secure the seam along the base when I put my sides on. To this basic frame I screwed in 4 lengths of wood (I had used left over cedar again) measuring 1 by 6 inches. The 6 inch sides would fit perfectly covering the corner studs and over the piece of plywood base. I would screw the sides in at the corners and along the approximately 12 inch long piece of scrap attached to the base to close the seam as tight as possible. It is worth remembering that 2 of the sides, from the 4, will need to be trimmed down 1 inch so that they compensate for the overlapping sides when assembled to the square framework. That means that 2 sides will measure 1 by 6 by 46 1/2 inches and the other 2 sides will measure 1 by 6 by 48 inches. The most important thing for me was using scrap wood leftover from other projects. I happened to have cedar which is naturally resistant. You could conceivably use something like pine but you'd have to weatherproof it beforehand. 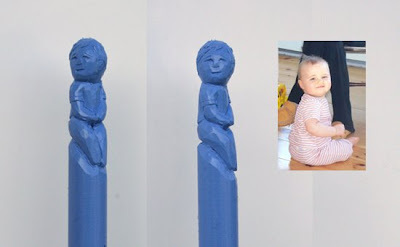 If you do paint your wood, I would suggest eco-friendly paint so that you might consider using the wood later for a fire when the kids have outgrown the sandbox. For screws I used leftover drywall screws with good teeth on them. Weather resistant screws would be ideal for use if you have them. And, I don't suggest nails, especially if you live in cold weather climates, since the give and take will expose them sooner or later. To finish off the project I screwed in some heavy rotating wheels under each corner and one in the middle of the underside for good measure and to handle the load. These you can find easily enough at your local hardware store. The larger the better since you want the sandbox off the ground by a decent amount. Then get yourself some bags of sand and pour them in. 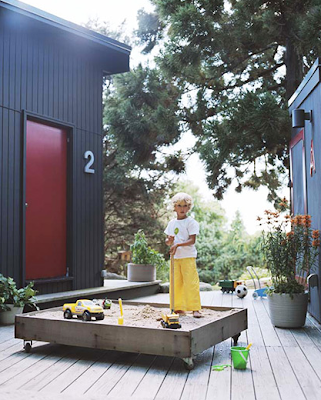 Though the sandbox is mobile with the wheels, it still will be heavy especially after you add the sand - so make sure you find the right location beforehand. I move our sandbox around the deck a bit so that I can sweep, etc.... but usually it takes a good push to get it started rolling! Well, I am so very excited to announce that Dan Zanes and Friends are coming to Rhode Island...Yipee! yes, he is our favorite and yes, the kids totally love him... I can attest to the fact that just about every kid that comes in my store knows who Dan Zanes is--AND loves him! But have you ever seen him in concert? this is some kinda show crazy songs, crazy music, crazy colors....everyone is CRAZY! 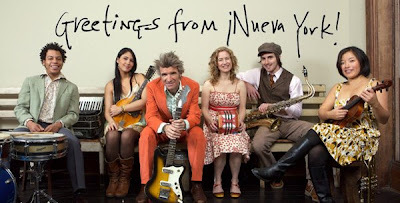 to purchase tickets for the Rhode Island concert of Dan Zanes and Friends click here. Wherever you can find them, don't miss'em!! This group will guarantee fun and laughs for you and your kids. Honestly, I hope my kids want to grow up and be just like Dan Zanes! yes, I think this has to be one of the wittiest forms of sculpture I have seen in...well a long time, maybe EVER! Diem Chau is a wonderful artist who hails from Vietnam but is now living in Seattle. 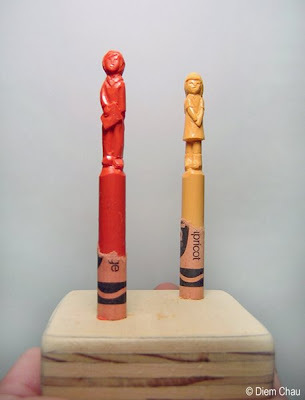 Her work is incredibly delicate and have you not always wanted a crayon that looks just like yourself!? I think that the best would be a whole family of crayons... and it could be a gradual thing, maybe you start with your kids and then move on up through your family! what a treasure. Diem's work combines common mediums and common means (I love that part about her!) to create delicate vignettes of fleeting memory, gesture and form. 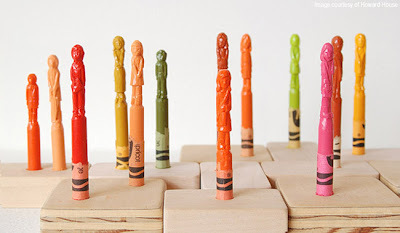 if you visit her website you can see the scope of her work (these crayon sculptures are just a 'part' of her work!!) her work has the feeling of storytelling...she does commissions so just email her and she can tell your story in crayon! she is wonderful and I hope you love her work as much as I do... so glad that I found you Diem! "I noticed that accommodationist chefs were making chicken fingers available in Italian, Chinese, and Japanese restaurants, where chicken fingers aren't even justifiable. I perceived that my children's chicken-finger meals outside the home were informing their eating habits inside the home....... In short, I came to the realization that America is in the grips of a nefarious chicken-finger pandemic, in which a blandly tasty foodstuff has somehow become the de facto official nibble of our young." I suppose because of the classiness of the restaurant, we could fool ourselves many times into believing that our kids were eating well. Nonetheless, a lot of the kids menus are not much better than if you were to have purchased them from a fast food restaurant. By the way, I also read recently in Contemporary Pediatrics, that those fast food meals for kids..... surprise surprise... still are not healthy. But, continuing further on what Mr Kamp brought up. I also have found that the average kids meal ordered off the kids menu is growing LARGER AND LARGER each time. My wife and I have now established a plan to get around that fact. We just order one plate for our kids and then divide it. We just can't stand to see the food wasted otherwise. And why the hell do our kids need such a huge portion to begin with.... wasn't the original idea to provide a meal that wasn't supposed to be the same size as the parents? Are many of these kitchens staffed with people who have no relation to children? Anyway, these days we have learned our lesson. We glance at the kids menu and usually skip it. We prefer to order an adult meal and split it amongst the kids - thus getting them a better meal choice. Or, so that we can bypass the usual french fry option, we order veggies off the side dishes and make up our own kids meal. Many times, it seems the only way to get around Mac and Cheese, Pizza, Chicken Nuggets, or Hot Dogs....... And, like Mr Kamp suggests, it is the only way you might get an opportunity to present your children with a diversity that you might enjoy when eating out. Now, I know that there are restaurants out there that have re-invented the children's menu - but they are, in my opinion, few and far between. What's with this trend towards blandness and large quantities? What does it say about us? Are we really becoming that lazy? We haven't had the best of weather these last few days. Unfortunately, that means the kids haven't been able to run around outside as much. And, well, I don't have to tell you what that can be like. We have exhausted the making of tents, cutting and gluing, drawing, and playing all sorts of games. The kids were getting restless when I remembered this project: making homemade snow globes! It's a very simple thing to do with the kids and you'd be amazed at how much fun they have helping to make them. Plus, the whole process easily eats up a good hour of concentration..... just enough time to keep them from destroying the house! You'll need some clean empty jars to recycle with screw on lids. In my case I had to sacrifice the last bit of jam so that I could get 2 jars alike (just to avoid another potential problem!). You take the lid off and with the help of your youngsters you find a small figure (preferably light and proportional to the jar's size) that you can glue to it - you can even make your own sculptures from paper clips, etc. Basically, anything easily glued down to the lid will do - but if your kids are like mine - they will surely want to personalize their snow globe with something special to them. In my case, I'm embarrassed to say that my little guy wanted to use some toy plastic soldiers.... oh well! Now, once you are finished with the lid you take the glass jar and you put some glitter in it. If you don't have any glitter you can experiment with something else that might work. You could use tiny cut up pieces of aluminum foil, uncooked rice, etc..... use your imagination. Then you fill the jar with some cold water, tighten on the lid after the glue has dried, and there you go! you can glue the lid to the jar if there is any leaking and just leave right side up until it's nice and dry. Additionally, though you might not be able to tell from the rather awful picture I have taken of the globes, you can even decorate the outside of the jar with stickers if you have them handy. As well, they can even write their names on the outside of the glass. The kids will love it all the more because they made it and you will love it because it will focus them on a project that you can do together. And after a few days when the water might start to cloud up, you can take it apart again and recycle. So, next time it rains, try it out and see what fun you can have in a short space of time!!! I know that cutting your kids hair can just sends shivers up some people spines, but I really like to do it... wielding a sharp scissors around your kids head can be pretty scary sometimes, but whenever I see a kid come out of a hair salon, no matter what it costs, with one of those sergeant haircuts I just want to die! so here it goes, as best I can, I will give you a guide to your kids back-to-school haircut a-la nonchalant mom (this is important because it will NOT be perfect!). first of all you will need a nice small haircutting scissors (and I know, it's scary, these are SO sharp! but if you use a dull set of scissors it won't really work) and a good small-to-medium tooth comb and a nice high stool. ok here we go...we usually do everyone in one day so that we can all get into it and no one gets left out, so either mommy or daddy will have to get a haircut too (whoever is not doing the cutting)! take one at the time and get them into the shower or just spray-wet the hair (I promise a shower works better). now you are probably going to have to give your child a lollipop for sitting still, just like the salon...so have this ready. I start with the top of the head and comb it up like a mohawk and trim a lot off the top, then pull out each of the sides and cut them with another good healthy cut and then pull out two at the back (each of these are just one cut--fast an easy)...technically it's called 'sectioning' I learned this term on 'shear genius' from sally hershberger..ha!... you might want to just check the center back quickly if you kids can stay seated that long, and then I also comb down the bangs and make sure they are short enough. for boys you might also want to check over the hears...eek! super scary...I usually just opt to leave them long though... so in total there are only about 5 cuts you are making...easy as pie! and I hope this makes sense, but practice on your spouse first to make sure you have a good grip on the scissors and then comb, it's a bit of a twister. 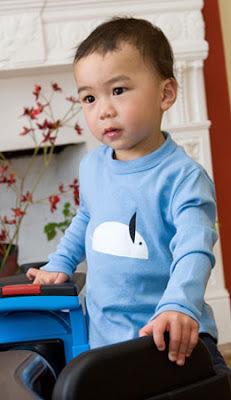 for the next few days I will be at the Bubble kids trade show in NYC, showing my Nonchalant Kids line for Spring Summer 2009 (no, that is not a typo...2009!! )...today was our first day and I happen to have a booth between two of my favorite kids brands, Romp and Lucky Fish! Lucky Fish you know from me talking about her many times and also on Nonchalant Mom, Jann and I have been friends since I decided to start my website in 2004 and over the years we have developed a nice friendship...it is amazing spending a few days together and working so close, I learn a lot about our business and we spend most of our time coming up with ideas for the future!! projects that make the world of kids more exciting for all of us. we also talk a lot about working and raising our kids, Jann in NYC (Brooklyn to be exact) and us in Rhode Island and even though they are worlds apart there is always something you learn from friends and parenting. and by the way, for next summer she knocked her designs out of the park...they are outstanding! but you have to wait until January! 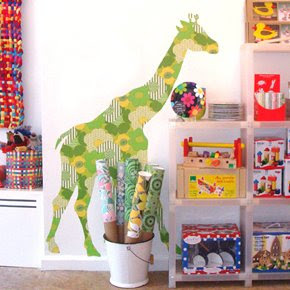 Jenn from Romp is the person who brought us the wonderful world of Inke Helland, the dutch artist who created the wall silhouettes made of vintage wallpaper (and YES I have them on nonchalant mom!!). these cut out shapes transform any room into a wonderland of creativity for your kids...and the engaging animal friends that can become a part of their life will be a treasured memory forever! Jenn has become an inspiring friend as well, I think that a wonderful thing about these trade shows is that it gives us a chance to talk about the world today, what kind of role models our businesses can be for the industry and yes, we talk a lot about the difficulty (and JOY) of working and raising children--having businesses, which we decided hands down that we all love, but mostly how it feeds our souls to do both! So you can be assured to see some more creativity out of all of us! and over dinner tonight with Jann (Lucky Fish), Jenn (Romp), Meg & Teresa (Kit+Lili), and Julie (who's jewelry, Verre, you will see on my website to come!! ), we came up with lots of ideas to make all of our businesses more fun and exciting for you...so as always there is more to come!! so stay tuned!